The Second Annual Gathering of TR’s will be held in Medora July 17, 18, and 19. Tickets are just $10, and can be picked up at all ticketing locations in Medora. The day will be filled with performances, classes, and much more! Read on for all the details. 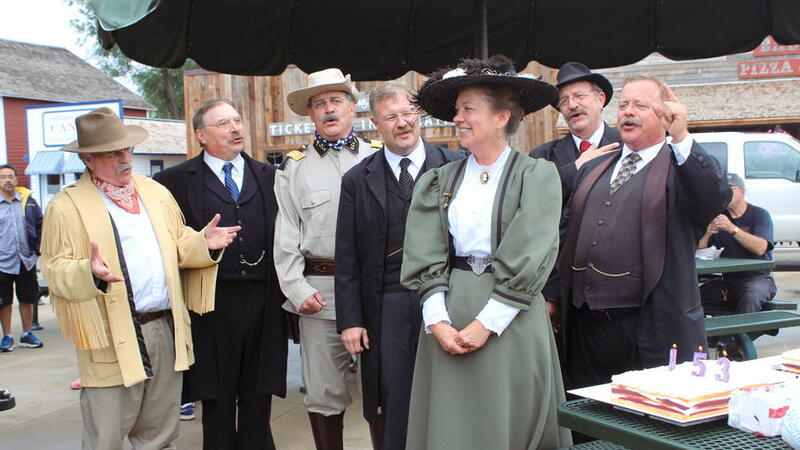 (Medora, ND) – On July 17-19, 2015, the Theodore Roosevelt Medora Foundation (TRMF) will host its Second Annual Gathering of Theodore Roosevelt re-enactors. In 2014, six “Theodore Roosevelts” from five states came together for the first ever, “Gathering of TRs.” They shared stories and the stage, while performing their various interpretations of the Rough Rider at Medora’s Old Town Hall Theater. They were joined by one re-enactor who portrays TR’s wife, Mrs. Edith Roosevelt. This July, at least ten TR re-enactors from nine states are confirmed, as well as the previously mentioned Mrs. Roosevelt. Highlights will include an acting class titled, “Acting Like Theodore Roosevelt.” The class will be led by Fargo-based actor/director Martin Jonason. One of Jonason’s first jobs was the portrayal of a young Theodore Roosevelt in, “Old Four Eyes,” the long running play that preceded today’s Medora Musical. 5:00–5:45PM – TRs and Guests dinner at Chuckwagon. 6:00-7:15PM – TRs & Guests greet at the Pitchfork Steak Fondue (PSF) & Welcome Center at Medora Musical promoting Saturday. Jared Mason, Former Medora Musical Cast Member, to put on a solo concert July 25 – July 31.